What is ArcGIS Pro Named User licensing? You must be a member (a named user) of an ArcGIS Online organization. In the ArcGIS Online organization, you must have a user type that is compatible with an ArcGIS Pro license or that includes an ArcGIS Pro license. The Creator user type is compatible with an ArcGIS Pro license. The GIS Professional user type includes an ArcGIS Pro license. If necessary, you must be assigned an ArcGIS Pro license by the organization administrator. An administrator sets up the ArcGIS Online organization and adds members. The administrator specifies the user type of each member. As needed, the administrator assigns available ArcGIS Pro licenses to members with compatible user types. The administrator enables My Esri access for those members to download ArcGIS Pro. The members download and install ArcGIS Pro. The members start ArcGIS Pro and sign in with their ArcGIS Online account credentials. 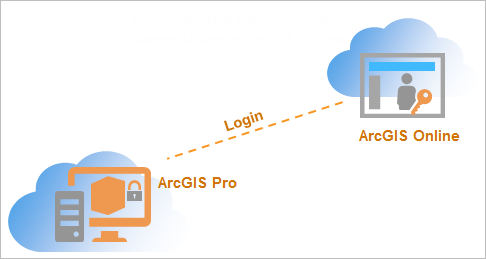 When a named user signs in to ArcGIS Pro, their credentials are validated in ArcGIS Online and the application is unlocked. This process is explained in more detail, for ArcGIS Online administrators and ArcGIS Pro users, in subsequent help topics. The software download procedure in your workplace may be different. For example, download and installation may be handled by a support department rather than by individual users. ArcGIS Pro is part of ArcGIS Desktop. An ArcGIS Desktop purchase includes ArcGIS Pro and the ability to set up an ArcGIS Online organization. For each unique ArcGIS Desktop license, one member can be added to the ArcGIS Online organization. The member can be given the Creator user type and assigned an ArcGIS Pro license. ArcGIS Pro licenses can also be purchased separately from ArcGIS Desktop. These licenses can supplement existing ArcGIS Desktop licenses or can be used with an ArcGIS Online subscription that is independent of ArcGIS Desktop. Every member of an ArcGIS Online organization has a user type. The user type defines the member's ArcGIS Online capabilities and access to ArcGIS applications. The Creator user type is compatible with an ArcGIS Pro license, but does not include it. The GIS Professional user type includes an ArcGIS Pro license. Each ArcGIS Desktop license makes one ArcGIS Pro add-on license and one Creator user type available in the ArcGIS Online organization. This means that a member can be added to the organization as a Creator and assigned an ArcGIS Pro license. You can purchase additional user types and assign them to members of your ArcGIS Online organization. If you purchase Creator user types and want to assign ArcGIS Pro licenses to them, you must purchase the licenses separately. A GIS Professional user type can be Basic, Standard, or Advanced. Each of these user types includes an ArcGIS Pro license of the corresponding level.